The consequences of driving whilst using a mobile phone can be disastrous and the law has attempted to clamp down on this ‘inexcusable habit’. 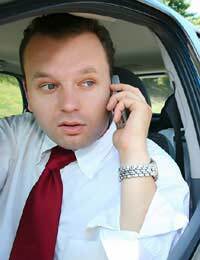 The mobile phone has become such an intrinsic part of our every day lives that some have found they can’t even leave it alone when they’re driving a motor vehicle. The dangers of speaking on a mobile handset or sending or receiving a text whilst behind the wheel have been widely reported – research claims you are four times more likely to be involved in an accident - but it hasn’t stopped such irresponsible and selfish behaviour from becoming widespread and a serious safety threat to other road users. Ultimately it has been left to the law to enforce a crack down. Regulations banning the use of a hand-held mobile, or similar device, while driving or riding a motorcycle were first implemented in December 2003. From then on drivers caught in the act were liable to be slapped with a £30 fine, which could be increased to a maximum of £1000 - £2,500 for drivers of coaches, buses of goods vehicles - if the offence goes to court. The new law prompted a great deal of confusion amongst car drivers and about how it likely would be interpreted by the police. In particular many were unclear as to what type of equipment would be legal or otherwise. However, it wasn’t badly worded legislation that caused the confusion, but irresponsible media coverage and retailers more interested in selling phone equipment. Essentially, the law made it an offence for someone to hold and operate a mobile phone in their hand while they are driving, or to use the device – even if it is in a cradle - for sending or receiving data, such as emails, texts or picture messages. The legislation therefore concerns driver behaviour and not equipment types, beyond hands-free kits, which escaped the ban. With more than 168,000 people being fined for using a mobile phone while driving in 2006, three years on from the ban, it seems that not only the dangers but the law was struggling to sink in with drivers. In fact the figure showed a 30% rise on previous year, suggesting the problem might even be getting worse. Nevertheless, having had more than adequate time to get used to the ban, the law was strengthened in February 2007. This involved raising the fine to a £60 and, as an extra deterrent to the persistent law flouters, introducing a three point licence penalty. The legislation also responded to calls that there is no safety benefit to hands-free kits, and so anyone not in proper control of their vehicle using hands-free would also be liable for prosecution. Efforts in hammering home the message of zero tolerance did not end there. In September, the Crown Prosecution Service (CPS) announced that dangerous driving caused by mobile phone use will carry a potential prison sentence of up to two years and/or an unlimited fine. Therefore if a driver is guilty of not being in complete control of their vehicle whilst operating a mobile at the time, then they can be charged with dangerous rather than careless driving, and face the stiffer penalty. Hands-free kits have proven a sticking point for the law against mobile use while driving because although now accepted as being as distracting as a handheld device, it is difficult for police to see it in use. Many believe this is why there has not been a total ban on all mobile use. However, if a driver is seen not to be in full control of their vehicle and when stopped is found to have been using a hands-free set then they are liable for prosecution. And if they have been found to be using a hands-free mobile prior to an incident or crash then it could be used as justification for a charge of careless or dangerous driving.